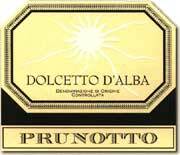 Dolcetto is one of the few Italian wines that I really haven't been able to fully explore through a wide variety of producers. Most of the one's that I've tried are simple red table wines with not much going on in the way of true complexity. The grapes for this wine were sourced from vineyards in the areas of Barbaresco, Treiso, Alba and Monforte. The wine is 100% Dolcetto and I believe was aged for a short period in stainless steel tanks. On the nose I get some light red fruit notes; cranberry, cherry, red currant. There is an obvious earthy and steely component as well. On the palate the wine is again very light in flavor and texture and shows some soft cherry and cranberry notes. There are also some subtle hints of earth and leather.